I’ve been a fan of iomoi.com for years, and I am loving their new custom lacquer trays! I could piles these on my coffee table, side tables, nightstand, bathroom, and pretty much anywhere to store anything and everything! 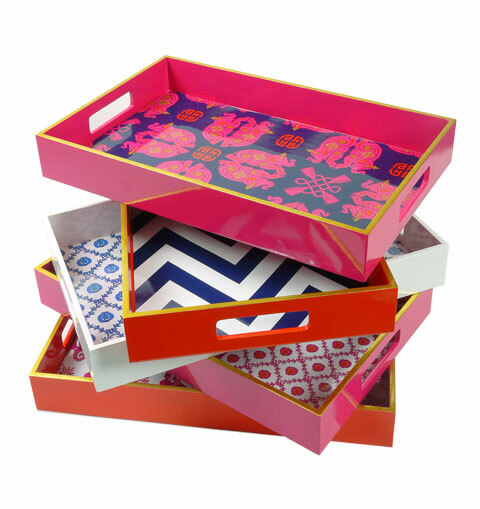 I love the top design and the chevron, and the colorful edges on the trays add a great touch, don’t they? Each tray is created by a vietnamese craftsman(!!! ), taking up to 105 days and 17 coats of lacquer (and polishing) to complete. No wonder they cost an arm and a leg! $150 for the smallest size, going up to $275 for the large tray. Previous Previous post: Coachella Round 8! Next Next post: coachella memories and icloud.